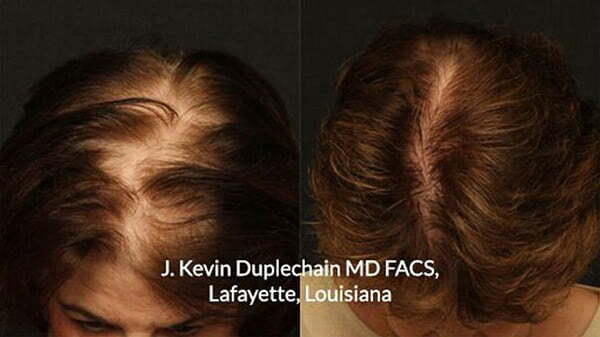 Restore your own natural, healthy hair to thinning areas with minimal downtime and no linear scar. Safe, effective & long-lasting natural hair replacement for men and women. Automated follicular unit extraction (FUE) results in faster, gentler procedure with higher follicle success rate. Cut & style or color your hair anyway you want after treatment—there's no linear scar to hide. It’s estimated that 85% or more men experience significant hair thinning by age 50. But hair loss is far from being a “man’s” issue only—millions of women suffer from hereditary or age-related hair loss too. But knowing you’re not alone isn’t always enough to overcome the negative impact that losing your hair can have on your appearance and self-confidence. If you are a man or woman bothered by hair loss, Dr. Gregory Buford may be able to help you restore a fuller, thicker head of your own natural hair without major surgery and without a telltale linear scar. Dr. Buford is proud to offer the NeoGraft® Automated FUE Hair Transplant System for our patients. NeoGraft is FDA-cleared and clinically proven to offer safe, effective and lasting hair replacement for men and women suffering from moderate to advanced pattern baldness and hair thinning. Before & after* NeoGraft Hair Transplant System. Photos courtesy NeoGraft. NeoGraft improves the hair transplant procedure. There’s no linear scar, for starters. For decades, getting hair transplants meant having a large strip of skin removed from ear to ear on the back of your head, from which a surgeon could harvest hair follicles for transplantation. This is because hereditary baldness typically affects the front, top and sides of the head, but follicles on the back of the head continue to produce healthy hair for life. The problem with this method is that it requires a lengthy surgery using general anesthesia, followed by several weeks of downtime for recovery—only to leave a long, linear scar on the back of the head. NeoGraft is different. It’s a minimally invasive procedure that uses automated follicular unit extraction (FUE), which allows Dr. Buford to gently extract individual living hair follicles without a scalpel incision, and then quickly transplant them in a natural pattern to restore fullness to balding or thinning areas. The procedure requires only local anesthesia, and can be performed in just a couple of hours. Gentler, faster hair restoration. The automated process is more comfortable and quick than older technologies. No linear scar. You can wear your hair in any style you want without worrying about hiding the effects of your procedure. A higher success rate compared to manual follicular unit extraction—NeoGraft minimizes damage to follicles, meaning more transplants are likely to survive in their new location. Quicker recovery. Most patients resume normal activities after just a few days of downtime. Lasting results. After your hair transplants complete the initial regrowth phase (usually about 3 to 6 months), you’ll have continued healthy hair growth from those follicles for years to come. First, Dr. Buford will create a map of the exact sites where he will transplant the follicles for a naturally attractive hair pattern. Before your NeoGraft procedure, one or more small areas on the back of your head will be shaved, and both the donor site and recipient sites are numbed with local anesthetic to keep you comfortable. With his experienced nursing team assisting, Dr. Buford will carefully harvest hair follicles from the donor areas, and transfer them to a temporary chamber to await transfer. When extraction is complete, Dr. Buford will then use the NeoGraft device to implant each follicular unit to naturally fill out sparse areas. When you choose Dr. Buford for your hair restoration treatments, you are not only choosing an experienced board certified plastic surgeon, you are also choosing one of Denver’s leading anti-aging specialists. Dr. Buford has helped thousands of men and women fine-tune their appearance and lifestyle to maintain a naturally youthful face and body over time. He understands the nuances of facial aging and anatomy and has the aesthetic skill to restore a natural hair pattern using NeoGraft and other restorative treatments. PRP (platelet rich plasma) therapy). PRP is a very quick, in-office procedure that uses growth factors in your own blood to stimulate hair follicle growth. Nutrafol hair health vitamin formula. Nutrafol is a patented “nutraceutical” blend that helps to slow premature hair loss by reducing inflammation that is known to interrupt the healthy hair follicle growth cycle. When taken as directed, Nutrafol can restore a more normal, healthy growth cycle for fuller, thicker hair. Personalized anti-aging treatments including ProCell microneedling, Aethern Advanced Skin Beauty program, and other restorative treatments to encourage healthy cell turnover and DNA repair. What is recovery like after NeoGraft? Following NeoGraft, you’ll be able to go home to rest. You may feel soreness or tenderness in the treated areas after your procedure, but pain isn’t usually an issue. Most patients return to work in 1 to 2 weeks or less. There are no staples or significant incision sites, but you will need to keep the treated areas clean and protected—Dr. Buford’s staff will go over post-procedure care in detail with you. NeoGraft transplants your natural hair follicles, so they’ll undergo the same natural growth cycle as your other hair. Results come in gradually after an initial, normal shedding stage. New growth is usually visible within a few weeks of treatments, and full results are usually in place about 3 to 6 months after the procedure, depending on your natural hair growth rate and how long you wear your hair. While the treated areas will enjoy healthy hair growth for many years, NeoGraft cannot stop hair loss altogether. Over time, you may experience additional hair loss in untreated areas. In this case, Dr. Buford can perform follow up NeoGraft treatments to help you maintain a full head of hair over the years. If you are a man or woman bothered by moderate to advanced hair loss who wants to restore natural hair growth with a minimally-invasive option, NeoGraft is likely a good option for you. It is not intended to treat severe or complete baldness. If you are just beginning to notice a receding hairline or areas of thinning, PRP (platelet rich plasma) therapy with Dr. Buford may be a good option for you to significantly slow hair loss and postpone the need for hair transplants. The best way to determine the right hair restoration option for you is to meet with Dr. Buford for a personal consultation.